Snow! But not enough to interfere with travel, just enough for prettiness. 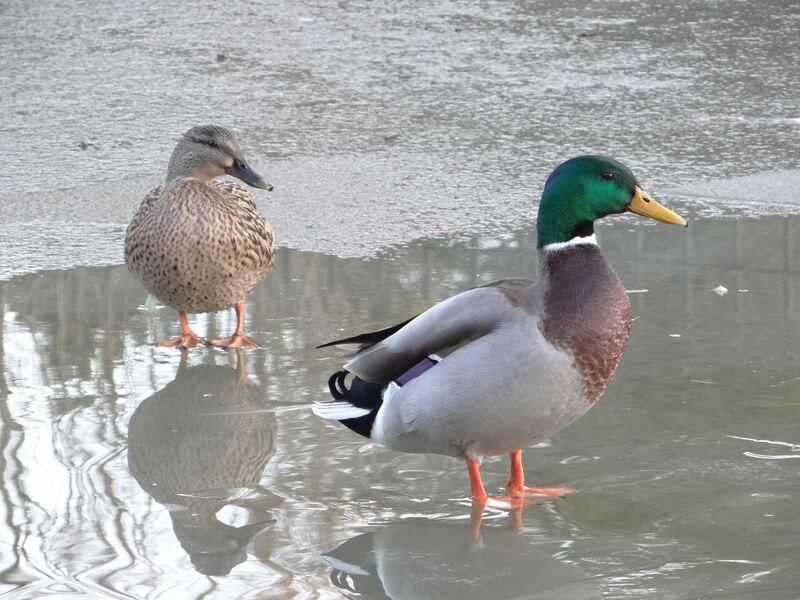 The ducks weren’t quite sure what to make of it though. This evening, the moon was full, so I went out to take some photos – not that it will look any different from the shots I’ve taken before, but it’s fun (if a bit cold) trying out different settings on the camera. None of them worked too well though, as I’ve misplaced the tripod attachment, so I was balancing the camera on a step-ladder. Not ideal. 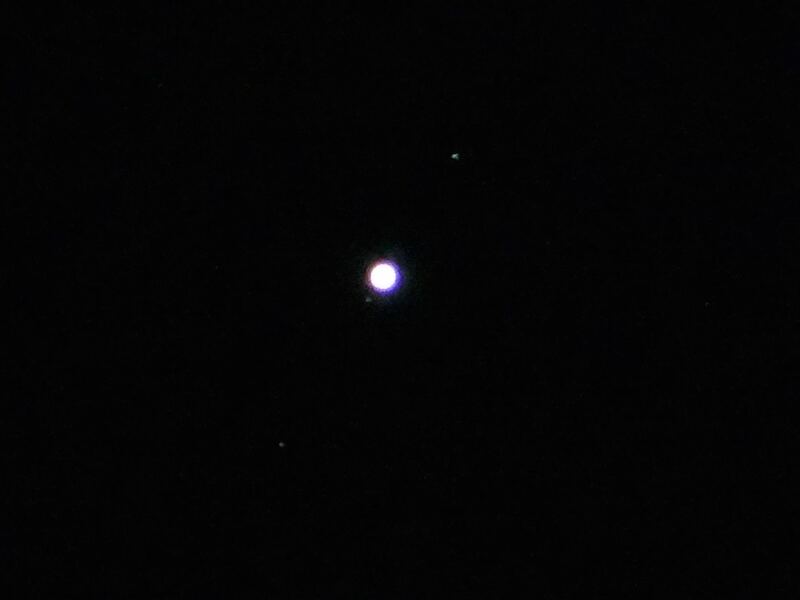 Even so, I managed to get some pictures of Jupiter (shining brightly a bit to the left of the moon, should you want to go and have a look outside), and by zooming in and playing with the settings, I picked up three of its moons too (all in a straight diagonal line from bottom left to top right). I’ve posted pictures of them before, but it still amazes me that I can photograph them. Apparently Jupiter is between 300 and 600 million miles away. I can’t really imagine that. 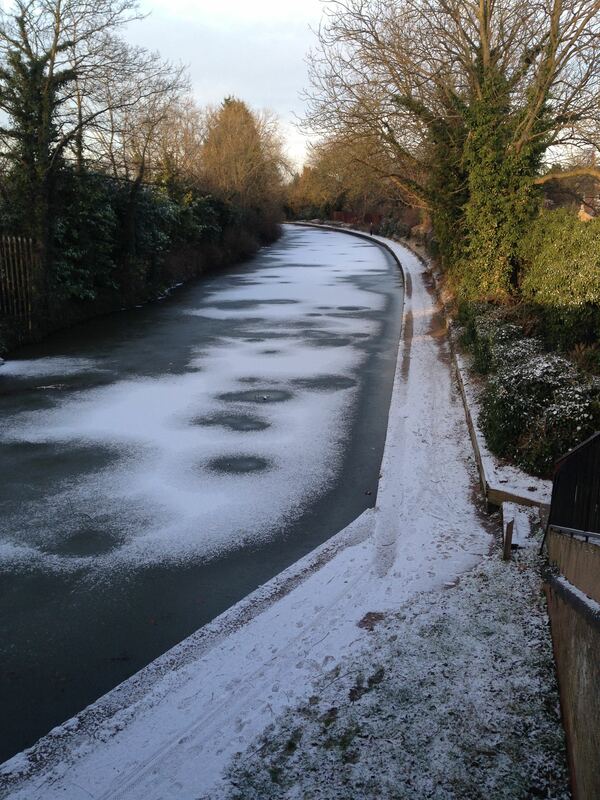 Categories: nature, night sky, weather | Tags: canal, Grand Union Canal, ice, Jupiter's moons, snow | Permalink. Syntrichia ruralis ssp ruralis “Great Hairy Screw-moss” – it’s big for a moss, with leaves about 5 mm long. Very pretty. The rounded leaves are young Hairy Bittercress (Cardamine hirsuta). I went out yesterday to see if I could find any flowers to photograph, but ended up spending ages in books and online, trying to identify lichens and mosses. I think these are right, as they are ones I’ve seen before (but if you spot mistakes, please let me know). I also have quite a few more unidentified, so more work to do. Categories: biodiversity, garden, nature | Tags: biodiversity, bryophyte, lichen, moss, nature, Parmelia, Physcia, Syntrichia | Permalink. 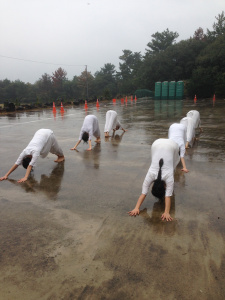 I just read this post from Red Hen Run’s blog, all about Google tracking where we’ve been with our phones. 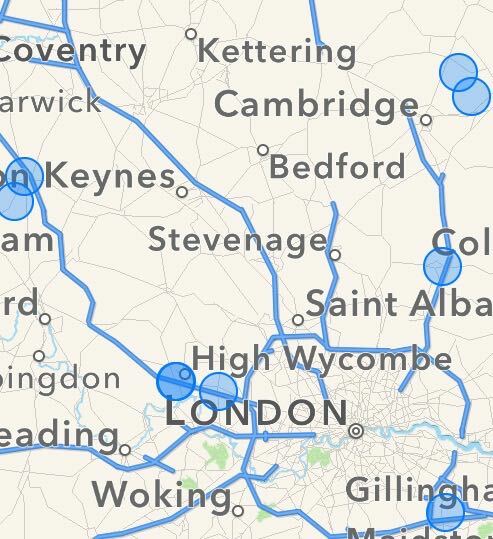 It turned out that I’ve somehow switched off Google tracking (info here) but then I decided to investigate Apple tracking (more appealing than the work I should be doing). I sort of knew my phone tracked where I’ve been, but it was a bit strange actually seeing a map. On the phone it doesn’t show the routes, just ‘frequent locations’ I’ve stopped at (though apparently the full data is stored and transferred to my desktop when I sync my phone). But it does also include full details of the times when I’ve been at each location (I can see just how many extra hours I’ve done at work!). The records go back further than a month. Here’s part of the map. Here’s where I found out how to view the map and details – and how to switch various things off, should you be interested. I’ve switched that off now, as it doesn’t seem all that useful, but it’s made me more aware of what my phone is up to. l don’t think you can actually stop apple collecting the data though, other than by switching the phone off. Categories: technology | Tags: apple, cell, google, iphone, maps, mobile, tracking | Permalink. Koreans traditionally divide the year into 24 seasons. Yesterday was the beginning of Ipdong, the first of the six winter seasons. 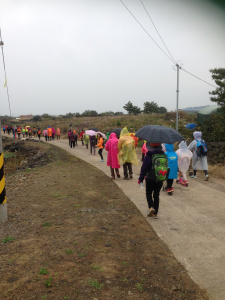 The climate on Jeju is milder than mainland Korea, due to its southerly latitude and warm ocean currents, but Mount Halla, at almost 2000 metres above sea level, usually has snow lying for at least three months of the year. Last Monday it received its first snowfall of the season, a full fortnight earlier than last year. We’ve had some lovely bird-watching weather this week. I’ve also managed to do a bit of running every other day – this morning even running halfway up a steep hill. Very slowly, and not for long, but I’m back running again, and that’s good. 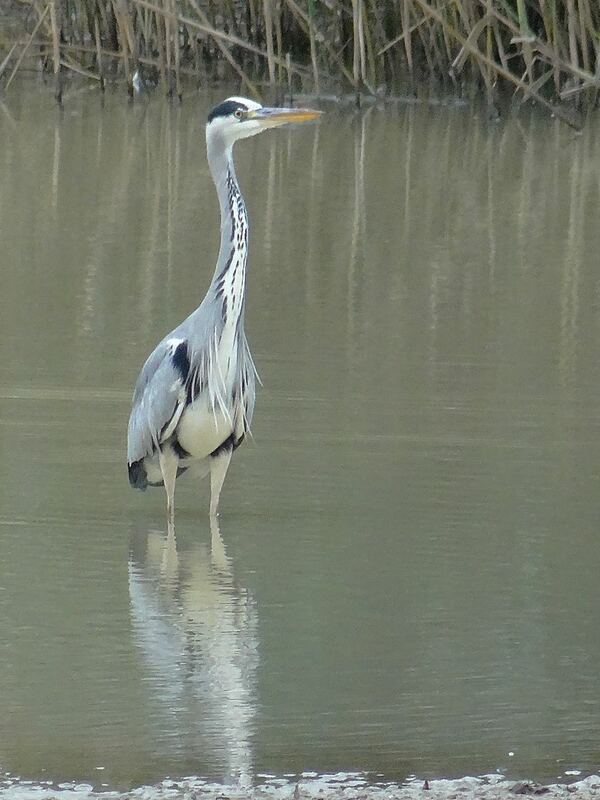 On Wednesday I saw this grey heron stalking fish. His (or her? how do you tell?) long streamer feathers blew about in the wind rather beautifully. 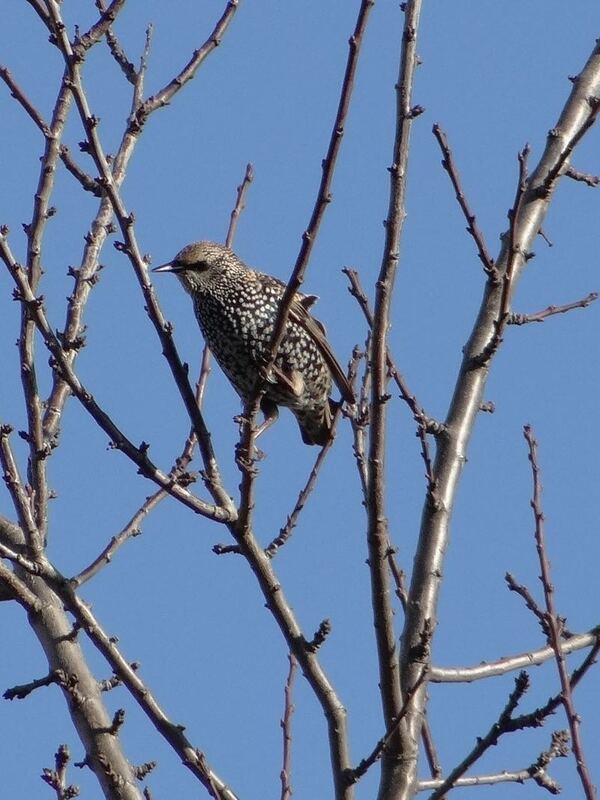 This starling was eyeing up the fat balls in our garden. The sheen on his feathers goes well with the shiny bark. We saw a flock of about a hundred starlings wheeling round over the village today. I hope they don’t decide to visit for fat-balls all at once. I need to remember to look out for them doing their evening murmuration acrobatics – though maybe they fly off somewhere else to do that. 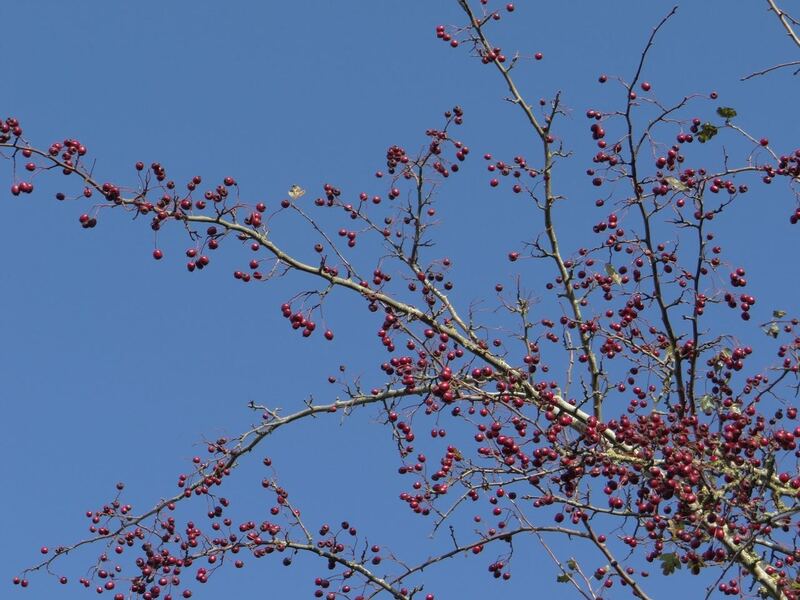 The clear blue sky set off these hawthorn berries rather well. There is quite a glut of hedgerow fruit- I haven’t yet seen any redwings or fieldfares, but they are apparently already around this area, according to my BirdTrack app. You can put in the name of a bird, and find out where it has been spotted in the past few days. Earlier in the week, I thought I’d heard a raven fly over our house, but as I’ve never seen one here before, I was dubious whether I’d misinterpreted the sound. But the app showed that they have been spotted recently nearby – and today we spoke to a farmer who said he’d seen ravens round here. It sounded really rather like a sick duck. You can listen to one on the RSPB site here. Categories: biodiversity, garden, running | Tags: biodiversity, biological recording, bird watching, BirdTrack app, grey heron, hedgerow, raven | Permalink. Descent of the River Avon in Bath, below Pulteney Bridge. 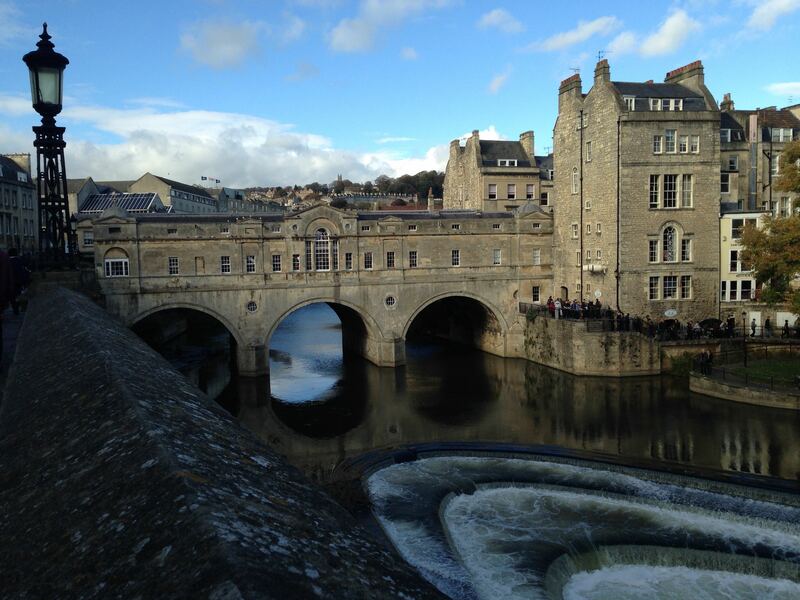 Categories: photo challenge | Tags: Bath, River Avon, weir | Permalink. We visited Bath this weekend, and it was gorgeous. Sunny and autumnal – my favourite weather. 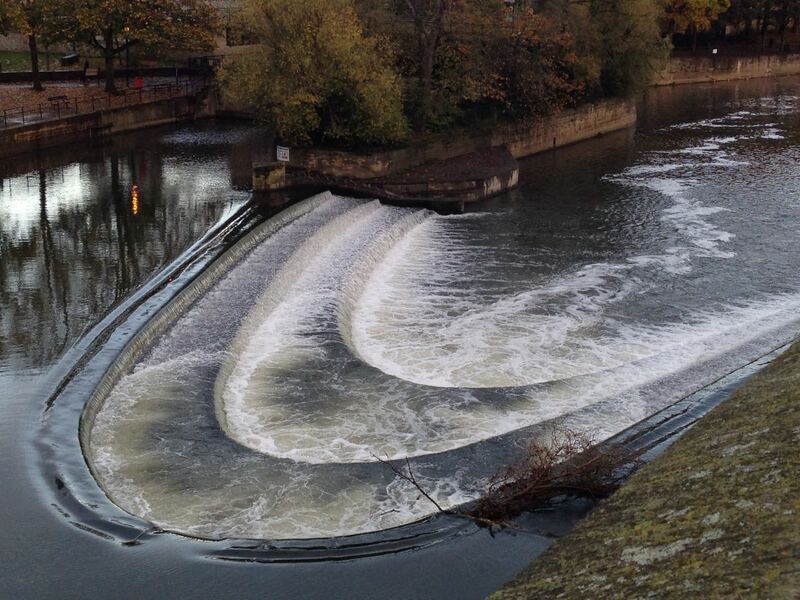 The weir below Pulteney Bridge is mesmering, with the water above it like an infinity pool. 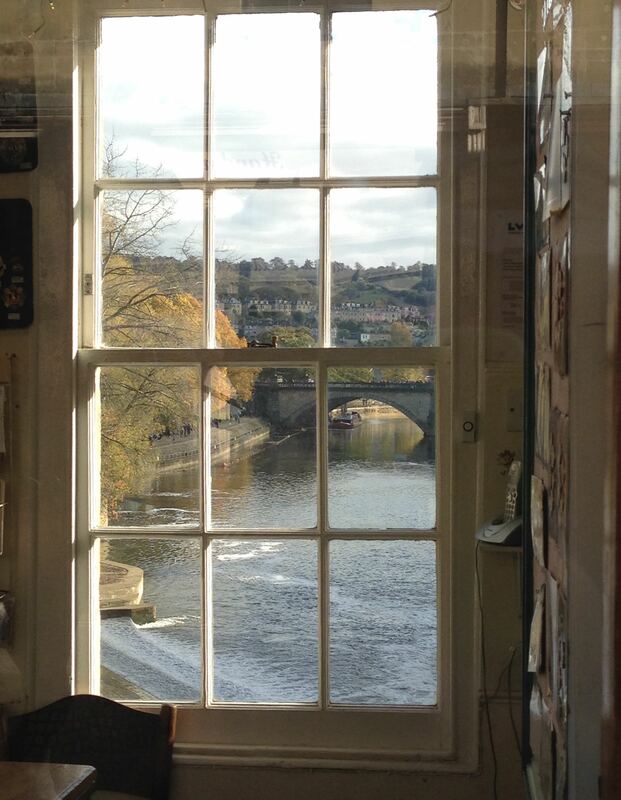 The tiny shops (not much more than a metre from front to back) on Pulteney Bridge have wonderful views out over the river. This photograph was taken right through the shop from outside. 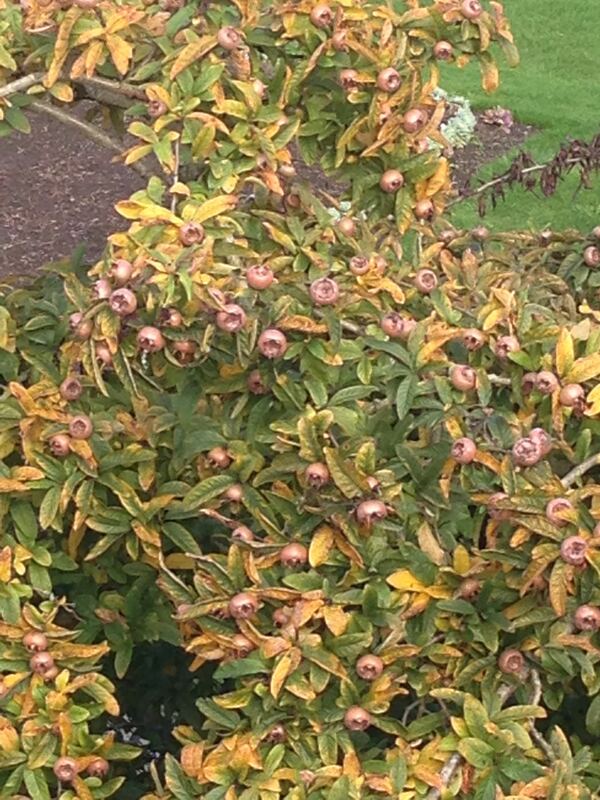 This medlar tree was laden with fruit – we were looking down onto it from above. They are very strange-looking – rather like gigantic hawthorn fruits. I haven’t ever eaten one – you have to leave them to ‘blet’, which effectively means, to rot. Which sounds rather dubious. On Friday night we had an excellent meal at the Circus restaurant (spiced pumpkin soup followed by lemon sole – mmmmmm). On Saturday morning, I was determined to go for a pre-breakfast run (ok, walk/jog) which was a bit of a challenge as I’d not slept too well from eating so much. However, it was a beautiful sunny morning, and I ran a little way alongside the River Avon. 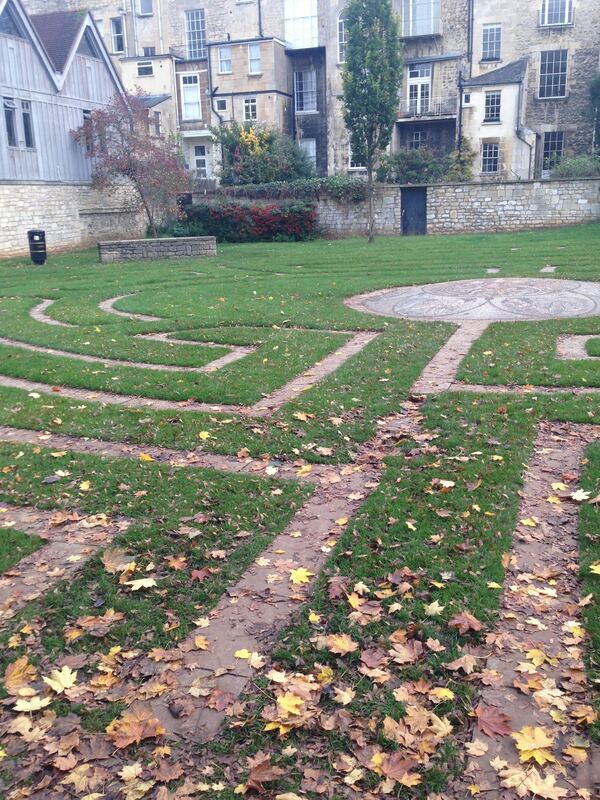 I found a lovely paved labyrinth to jog round. I didn’t quite complete the labyrinth, as I was distracted by the sight of this fine gentleman. 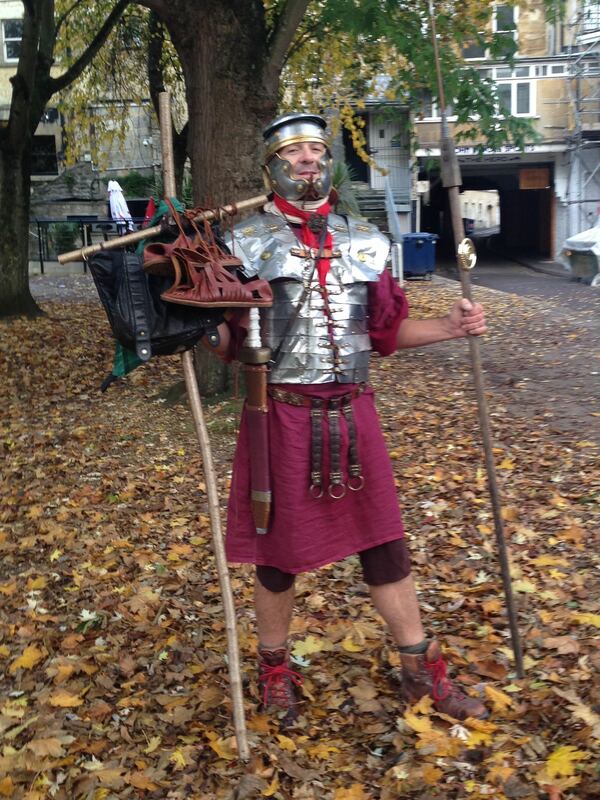 Roman centurion in Bath – not sure where he was heading, but he was happy to have his photo taken. 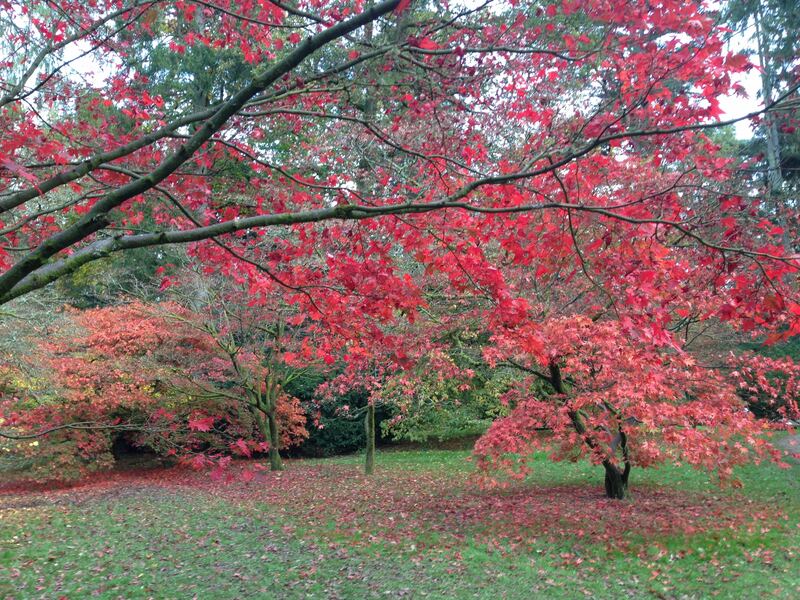 After Bath, we stopped off at Westonbirt Arboretum to see the autumn foliage display. The Acers (Japanese maples) were lovely, even though it wasn’t sunny when we were there. 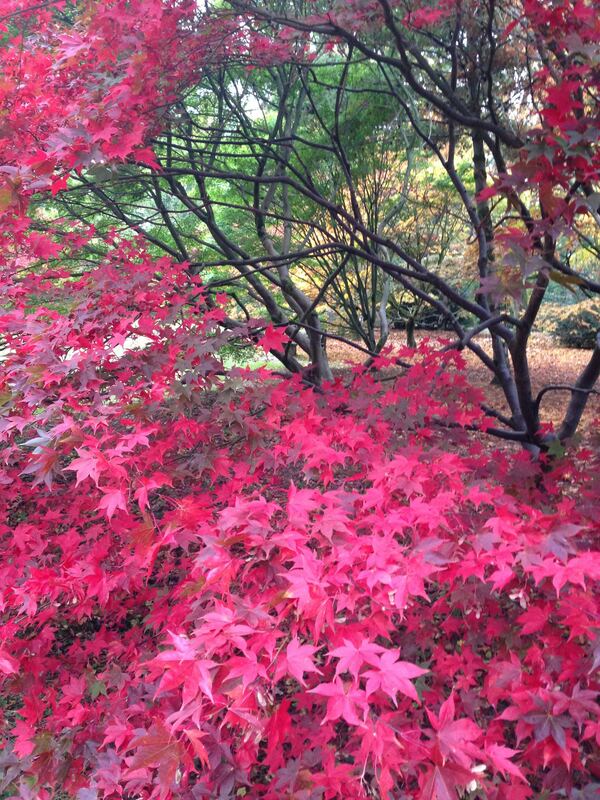 It was £9 per person to get into the arboretum, but I think we had our money’s worth for the wonderful colours. I have seen reviews on Trip Advisor saying that it was expensive, and more or less complaining that an arboretum only had trees in, which seemed a bit unreasonable. Though, admittedly, when we visited Westonbirt once before, many years ago, there were sculptures in amongst the trees, and it did add to the interest. Categories: architecture, garden, house and garden visits | Tags: arboretum, autumn, Bath, garden, Georgian architecture, Japanese maple, jogging, labyrinth, Pulteney Bridge, River Avon, Roman centurion, run, slow running, Westonbirt | Permalink.